You can also easily modify existing data. Just right click on an entry in the panel and pick Edit. As you can see in the context menu there are more actions related to data management. You can also remove existing or create new storage entries. The FireStorage Plus! panel offers also a few buttons for filtering its content. 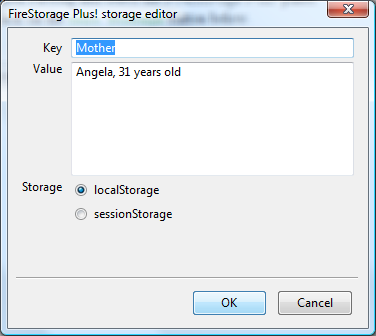 See extended example that also stores some data into the session storage. 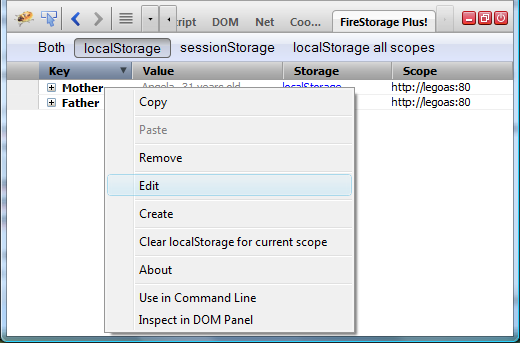 Note, that the (built-in) DOM panel has also basic support for data storage management. It's not that nice and useful especially in case of bigger amount of data, but worth of mentioning. Is there any other feature you'd like to see in this extension?